Horse Racing equipment is used for different reasons; the big one is to keep the horse focused on the race ahead of him/her. Trainers and owners will try different combinations of equipment to find out what will help their horse in the race. The combination can be blinkers & shadow roll or blinkers with cheater holes and many others. There’s a great possibility the horse will place better in the race with equipment changes. When a horse hasn’t performed well in previous races trainers or owners may make an equipment change to see if the horse performs better. 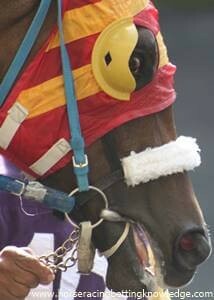 Equipment changes like blinkers being added or removing of blinkers will be noted in the program on race day. There will be a symbol in the program or if you are watching it on TV some announcer will say the changes. An eye shield device to block the horse’s vision on either side. Keeping him/her focused on the race and what is ahead of him/her. Encouraging the horse to pay attention to the race. Horses that wear blinkers don’t see other distractions that are happening around them, such as the crowd, cameras, and other horses. Blinkers which are can also be called Blinders are made of either plastic or leather material. The plastic and leather material makes it very lightweight to wear. Some horses may get spooked or perform poorly when their vision is completely blocked so they wear Blinkers with Cheater Holes. Horses have a great peripheral vision and can literally see behind them. In some cases, certain horses may need to peek behind them to compete better and or feel safe. It also gives them the ability to spot approaching competitors through the diamond-shaped holes cut. If they see competitors fastly approaching they will run faster. As you will see in this picture the horse is wearing Blinders with Cheater Holes and a Shadow Roll which we will talk about next. A Shadow Roll is usually made from sheepskin or synthetic material which is attached to the noseband. 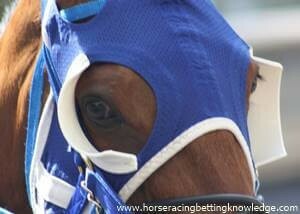 This is another piece of equipment that restricts the horse’s vision. Some horses will try and jump or get spooked by things on the ground in front of them. By restricting their vision from the ground they focus on straight ahead. It’s positioned halfway up a horse’s face to eliminate him/her from seeing shadows on the ground. The horse will then be focused on what is eye level verse what is beneath them. It helps the horse to stay focus on what is in front of him/her and not around them. This is something the trainers will try if a horse gets spooked easily. The Shadow Roll comes in different colors and a few sizes. The colors can be white, red, blue, green, purple and many other, sizes are anywhere from 2.5″ to 3″ wide. 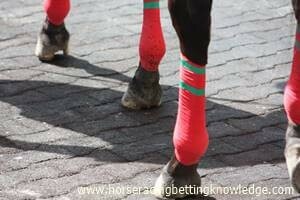 During Races, you will see a lot of horse have their legs wrapped in bandages. Some have all four legs wrapped and yet others may just have the front or just the back wrapped. There are several different reasons why trainers do this. Leg Wraps and Bandages are used to support and protect the horse’s legs. While running in a race a horse could injure Strips of cloth wrapped around the lower parts of the horse’s legs for support. Protection to prevent injuries to the horse’s ankles and tendons. Bandages are designed for the individual horse for there are different personalities of horsemen. Horseshoes are made up of metal but can also be made with partially synthetic materials. Horses wear shoes for the same reason people do, to protect their feet and to give them support. Horseshoes are nailed onto the horse’s hoof to stay on. 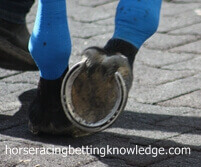 On race day hope your horse doesn’t have a new pair of shoes. Just like us, they need time to break them in before they are comfortable. Why do they tie the horse’s tongue in horse racing? You ask! There are a couple of different types that are used one is like a rubber band which is tied around the horses’ tongue. The tongue is then pulled to the side of the mouth. That is why you will see a horse’s tongue hanging out of its mouth. It helps keep the horse from putting his tongue over the bit, which could block the horse’s airway. It’s called Dorsal Displacement of the Soft Palate or (DDSP). The Tongue Tie helps keep the airflow smooth and enables the horse to race to its full capacity. It does not restrict the horse’s breathing. 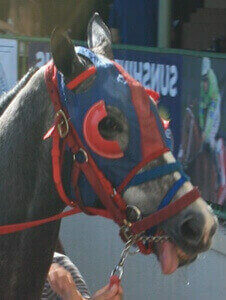 There is a bit of a controversy around the Tongue Tie but it is legal in horse racing. Horse Nasal Strips do the same exact thing as human nasal strips. They are self-adhesive strips that are places of the bridge of the horse’s noses. Just like humans use to promote optimum health and reduce airway resistance. It helps the horse to breathe more freely during a race. 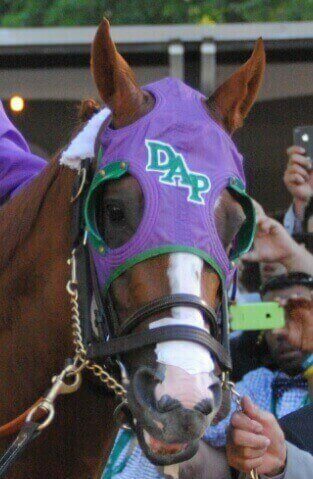 California Chrome wore a nasal strip during his run for the Triple Crown. 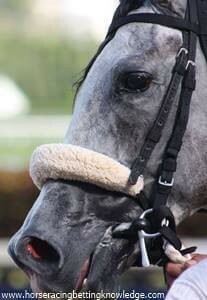 Even though Belmont Stakes in New York previous banned nasal strips during a race, that ban was lifted. Also known as the Crownpiece goes over the horse’s head holds the remaining parts in place. Throat-lash or also called the throat-latch prevents the bridle from coming off over the horse’s head. If the horse rubs his/her head on an object the bridle could come off. There are two Cheek Pieces one on each side of the horse’s head. The Cheek Piece is used in a similar way as the Shadow Roll, it keeps the horse focused on what is in front of him/her. Reins are the rider’s link to controlling the horse, they are on every Bridle. It’s kind of like a steering wheel to your car Jockeys guide and control the horse. The bit goes into the horse’s mouth. 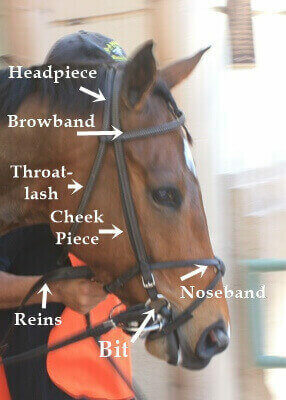 The Noseband is used to keep the horse’s mouth closed, or to attach other pieces or equipment.